Well, Spring Break is now behind us and I only have 42 working days till Summer vacation! I can do this! Hubby and I had a fabulous Spring break. It all started with a visit with my sister and her hubby in Lakeland, and next we spent the day with some cousins in Fort Myers, and finally we got to spend a four days with our Son and his girlfriend in Savannah. All in all it was a great week! Okay, onto today’s card! Over at Stamp TV my friend Donna is hosting a color challenge, and it’s Thursday so that means it’s time for a new challenge over at Seize the Birthday! Over at Stamp TV the colors we were to use were: Red, Black and White. They were pretty obvious weren’t they! 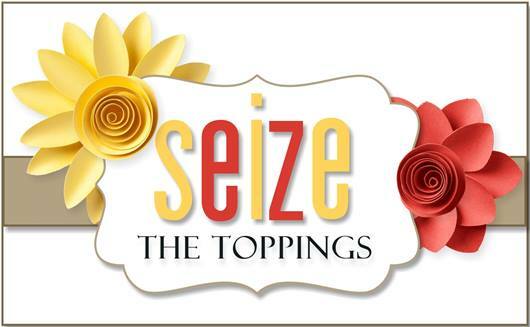 LOL Over at Seize the Birthday, our topping option this time around is Tall and Skinny. Remember our Topping is always an option, if you don’t want to make a tall and skinny card this time around, then just link up a Birthday card! It’s just that easy! We would love to have you join us! You should also go and see what my fabulous Design Team has done! WOW! Talk about a great variety of eye candy! Here are some card details! I paper pieced my vase with a very old piece of SU paper. I may have gotten a little carried away with the dots all over my card. Everyone of the small tiny dots on the vase and inside the flowers were made from paper, except for the white dots in the very center of the flowers. All the others were made with the smallest hole on the Owl SU paper punch. The black ones on the vase I added as well. I loved putting this card together. The banner and the stitched panels are from MFT. The stamp sets I used are both from Stamp TV; Birthday Labels and Flowers Bloom. I had to cut the sentiment apart and only use a portion of it as it didn’t quite fit. Categories: Cards | Tags: Card making, Cards, color challenge, Gina K designs, Happy Birthday, rubber stamps, Stamp TV, stamping | Permalink. Love that paper pieced case and the banner at the bottom is the bomb! 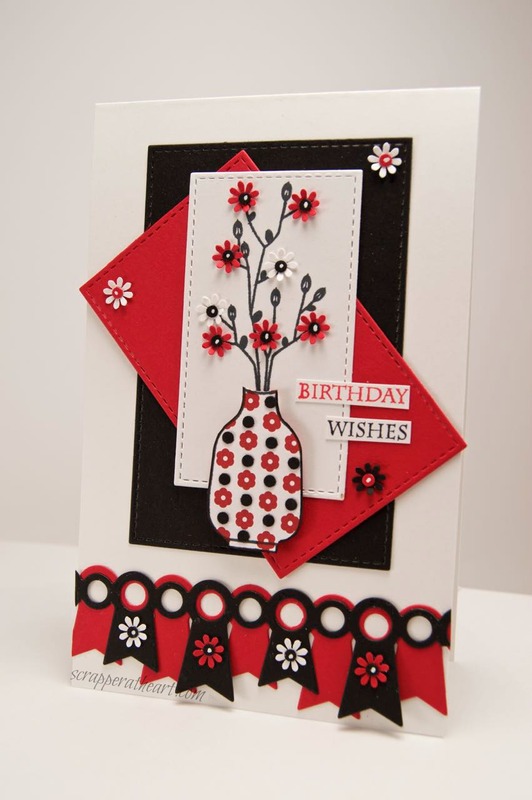 Very festive birthday card all in red and white and black. Gorgeous card and I love the layout and colors. Beautiful card Nancy. Love the black, white and red combo and all the pretty elements. This is striking! Great colors! The vase with flowers is fabulous! Those intricate flowers are so pretty! What a great palette to work with! Lovely! Adore this, Nancy!! Way to flash the Verve and the flowers on the banner tabs is fabulous! Love this classic colour combo too 🙂 Hope all is well with you ((hugs))! Your creation is absolutely gorgeous! Love the red, white and black together it’s so gorgeous! Love your layout, the vase with the flowers, the beautiful banner and of course those gorgeous stitched dies!